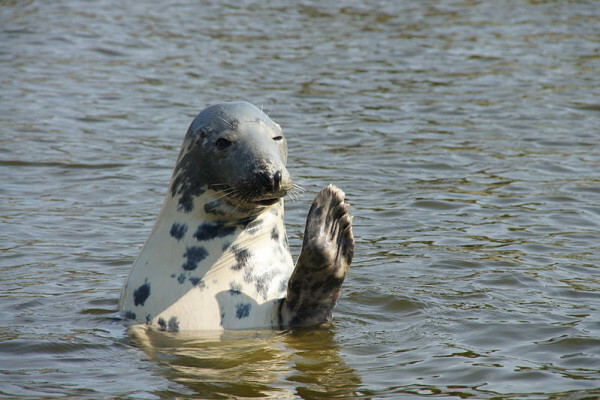 Seals use offshore wind farms and sub-sea pipelines as bases for their hunting and fishing exploits, new research has shown. The impact on fish and other invertebrates of the creation of artificial reef-like structures, including those that support off-shore wind turbines and pipelines, has been reasonably well documented in the past. But the effects on marine mammals - like seals - have never been studied. Would these animals be deterred from foraging by an operating wind farm? And would frequent vessel movements in the area to service and maintain the turbine array also impact on the animals? The question is an important one as human incursions into previously pristine coastline habitats, particularly for the purposes of electricity generation and fuel recovery, are steadily increasing. This prompted St Andrews scientist Deborah Russell and her colleagues to glue GPS trackers to the fur of 11 seals living along the coastlines of Germany and the UK near where there are two active windfarms. The tags beamed back high-resolution data on the movements of the animals which the team were able to plot on maps. Without even labelling up the positions of the turbines in the respective areas it was clear where the windmills were located: the seals' movements mapped out a near-perfect grid-like pattern on the sea as they navigated straight from one turbine to the next, presumably checking out the feeding opportunities offered at each site. The results, published this week in Current Biology, show that presence of the turbine array is clearly not deterring the animals, but it's possible that attracting them in this way could nevertheless have a detrimental effect on the environment. "What we don't know," says Russell, "is if these sites lead to an increase in fish numbers - and therefore an enhanced food supply for the seals - or whether the fish numbers remain the same but they just congregate there and are easier pickings for the seals. If that's the case, then this could have an effect on fish abundance." Establishing this will be the be the next step. Why does it take longer to cook two things in a microwave? Would modified escaped salmon breed with wild stock? Why can't energy be created or destroyed?